The quartet in the A.L. East has just gotten a lot more powerful. The expression, ‘beasts from the east,’ has never been more true than it is right now. The Rays, Red Sox, Yankees and Blue Jays look to improve on strong years that saw each of them support very respectable final records. So, what do these teams have to look forward to in 2009? Well, at least these are the guys I will be looking forward to seeing in 2009. The Red Sox have these guys. As if the Rays needed any more players young players. They have David Price. The number-one-pick overall in 2007, and it is easy to see why. He has wicked stuff. The Rays had enough confidence in him to close out games in the World Series. This year, he will likely be featured in an already steller pitching rotation that includes Scott Kazmir, Jamie Shields, Andy Sonnanstine and Matt Garza. Five legitimate starters going into 2009. Most teams would take any of these guys as their #2, if not at least #3 starter. The strength of the Tampa’s rotation will be tested against a division that just got a lot stronger in the pitching department. I’m really looking forward to seeing their young pitchers next year, especially Price (that god for MLBTV and MLB Extra Innings). Now lets state the obvious shall we. Everybody, me among them, is going to want to see what these lunkers will do. Yes, the Yankees landed the ‘big fish’ in the free agent market. Their team does look devastating on paper; however, as the old cliche goes: ‘games aren’t won on paper.’ These guys will compliment Arod, Jeter and Rivera in what the Yankees are hoping is money well spent. I think everyone is going to be interested watching these three, after the contracts they just signed. To be fair, the Yankees did have a lot of money coming off the books to facilitate this. Now for the Blue Jays. 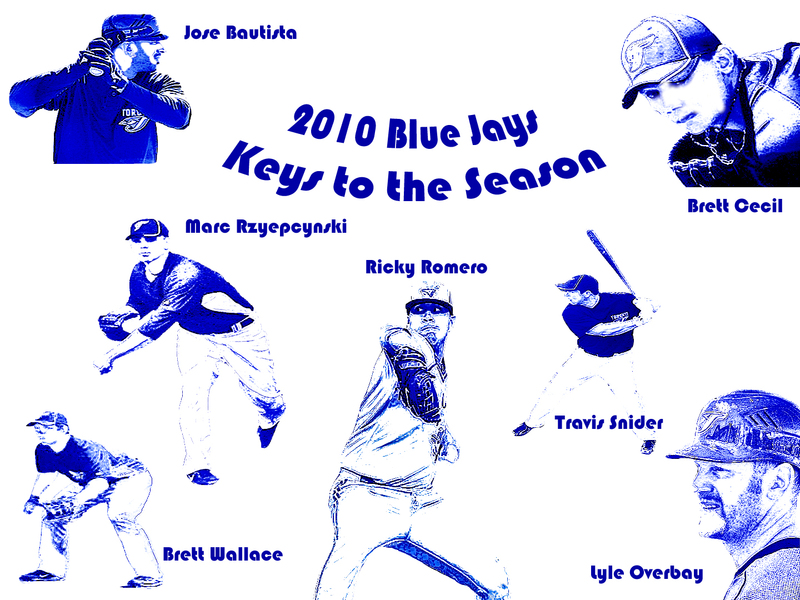 With all this looming above us (just scroll up), it is obvious the Jays will have a big challenge in 2009. We are no longer big players in the free agent market, with financial constraints the Jays cannot even afford a top 10 free agent without seriously having to budget. The Canadian dollar dwindling has hurt the club, there have been job losses in the organization (so much for me getting a job there) and we lost two of our top pitchers last season, Shaun Marcum (injury) and A.J. Burnett (free agency). Most prognosticators will predict the Jays to finish 4th in the division – just like last year no doubt. Some might even throw the Jays behind the lowly Orioles in the A.L. East. A team that I didn’t even consider for this entry because I’m not really looking forward to seeing anyone on that team (hmm… maybe Adam Jones). So, lets be positive, because none in the organization seem to be (i.e. Vernon Wells, Cito Gaston). The Jays are going to get a very good look at some young and possibly emerging players this year. Notably Travis Snider, Adam Lind, Dustin McGowan, Jesse Litsch, David Purcey and possibly even Ricky Romero, Brett Cecil, J.P. Arencibia and Scott Campbell. Travis Snider might be a ‘stud’ in the making, and if only Vernon Wells and Alex Rios could remain healthy, that would give the Jays a very strong outfield. McGowan staying healthy might actually lessen the burden of losing Burnett, Aaron Hill looks like he may be healthy and ready to get back to form, Jose Bautista and Rod Barajas are wildcards that may do well and we all hope that Scott Rolen has had enough time to rest his shoulder for a great 2009 campaign. This all being said, it will probably take all these things for the Jays to be anywhere near competitive in the A.L. East. way. Swish! Two Sinatra references in one sentence. So here I am spreading the news because he is leaving today. It is difficult not to love Burnett, because of the type of pitcher he is: fearsome attitude on the mound, cocky, throws heavy duty heat and is just flat out never scared on the mound. He knows he has the stuff, and knows he can back it up. The machismo, the hook, the heat, racking up the K’s and taking no prisoners, Burnett was awesome and he definately was one of my favourites on the team over last few years. However, for all these admirable qualities, there were a number of glaring inconsistancies with A.J. The Yankees will need to have a better have a catcher than the aging Jorge Posada now with Burnett on the mound. Burnett was always terrible out of the stretch windup. His ERA inflatates out of the stretch, opponent’s batting average goes up and he is generally just very slow to the plate. It is not often he gives up two hits in an inning, but when does, not being able to hold baserunners is a problem and it drove me crazy when I watched him pitch. With the Yankees now battling Tampa for the division, I can see this being a problem down the road. An obvious inconsistancy, is the injuries he has withstood in the past. In 2008, he spent limited time on the DL for the Blue Jays. Having him here in Toronto last season, pitching very well, almost made the last two years worth it. Burnett was limited by injury in those years posting 10-8 records in both seasons. Those are some mediocre numbers for a guy oozing that much machismo. Actually, when you look at Burnett’s whole career, with the exception of last season, he has never had more than an average pitching record. Maybe a bit better than average some years. A number of general inconsistancies. That is what Yankee fans will probably find with A.J. Burnett. He can be absolutely amazing one day, then another day, runners will reach base, they will steal and manufacture runs, and Burnett will be rattled. Struggling as he pitches out of the stretch all day. Some believe the Jays are now heading in a new direction. Saving the high free agent contracts to mid-level players, and only keeping the money for a few ‘big-time’ stars (i.e. Roy Halladay worth every penny!, Alex Rios worth it, and Vernon Wells??? not worth the injuries that is for sure). I don’t know if I see that for the future? J.P. still has to dump fairly high contracts to B.J. Ryan, Lyle Overbay, and Scott Rolen for that to happen. Cost cutting, and restructuring could be good for the Jays. Only time will tell, but now more than ever, we will see if the farm system that J.P. has been compiling can achieve the great things that some people foresee. Adam Lind, Aaron Hill, Travis Snider, David Purcey, Jesse Litsch, Casey Janssen, Brett Cecil, Ricky Romero, Scott Richmond, Brad Mills and Dustin McGowan in particular. Boys, it is your time to shine. A.J. 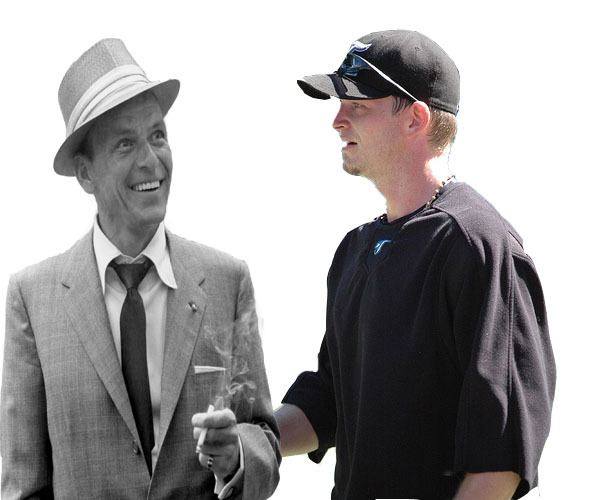 Burnett meet Frank Sinatra. I know you are more in to heavy metal and alternative music. Maybe, you’ll grow a taste for hearing Frank at the end of the game? Its up to you Burnett, Burrrrrnett! Dun, dunna, dunna, dun, dun, dunna, dunna, Dun!